We are halfway through another week! 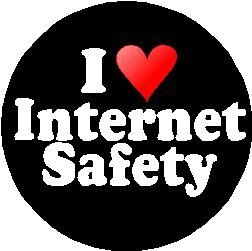 Today I want to talk to you all about internet safety! It’s hard to know the extent of the internet when you are sitting alone in a room with a computer but the reality is that you are never alone on the Internet! Being a blogger internet safety is something I take really seriously! I am a very trusting person and I love all of my new friends I’ve met through being a blogger! But it is important to make sure you know exactly who you are talking too, and sometimes that’s impossible! Online dating has become one of the most common ways to meet people now a days but make sure you take proper precautions before meeting these people. Social media can be fun but make sure you are safe about it! Whatever you post can come back to bite you one day! Think before you post! One important thing to remember when playing around on the internet is cyber bullying! It’s a huge problem and can do real damage! Cyber bullying is just like regular bullying, people feelings get hurt regardless of it being typed out or spoken! No one wants to be bullied! There are mean people who prey on others for reasons I will never understand! Please use the internet wisely! I want you all to be safe and be kind!